It’s starting to get chilly in Nashville! Well, not really chilly per se, but we’re in that weird stage of fall weather where it might be hot! It might be cold! It might rain! You just don’t know! 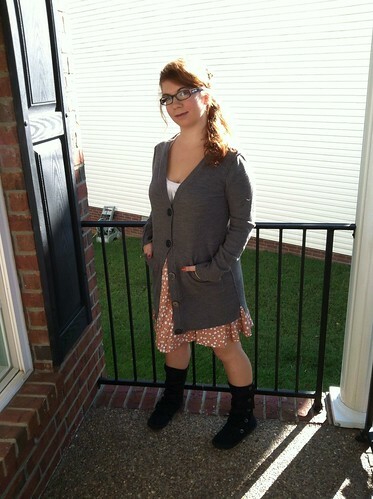 So I’m wearing a big old cardigan and boots with a skirt and bare legs. I probably needed to dress more like an adult than wearing hobbit boots and a side ponytail, but I’ve pretty much given up on that. I just want to look decent, feel good in what I’m wearing, and be comfy. And this one fits all those requirements! So I’m happy.